When you do this, you’ll be asked for your phone numbers so we know which numbers to protect. Your subscription will be activated immediately. You will be ready to start using the bots! You’ll be able login to our website…we call it our “Pirate Porthole,” where you can adjust the settings and tailor this service to suit your needs (check out the screenshots below). Which bot do you want to use? You can dial a bot directly (here’s a list), or just dial 206-259-4999 and we’ll randomly pick a bot for you. Or, you can sign in to the Pirate Porthole and setup favorite bots for each phone number. You can listen to it by signing in to the Pirate Porthole and going to your “Call Log” page (see picture below). This page has info and recordings for all the calls that our bots handle for you. Try “Summoning a Pirate,” because it’s an easier way to merge bots with telemarketer calls. Set up “Pirate Voicemail” so that you can easily screen your calls using Whitelists and Blacklists. This will automatically send the bad guys straight into the arms of a bot without you having to do anything. 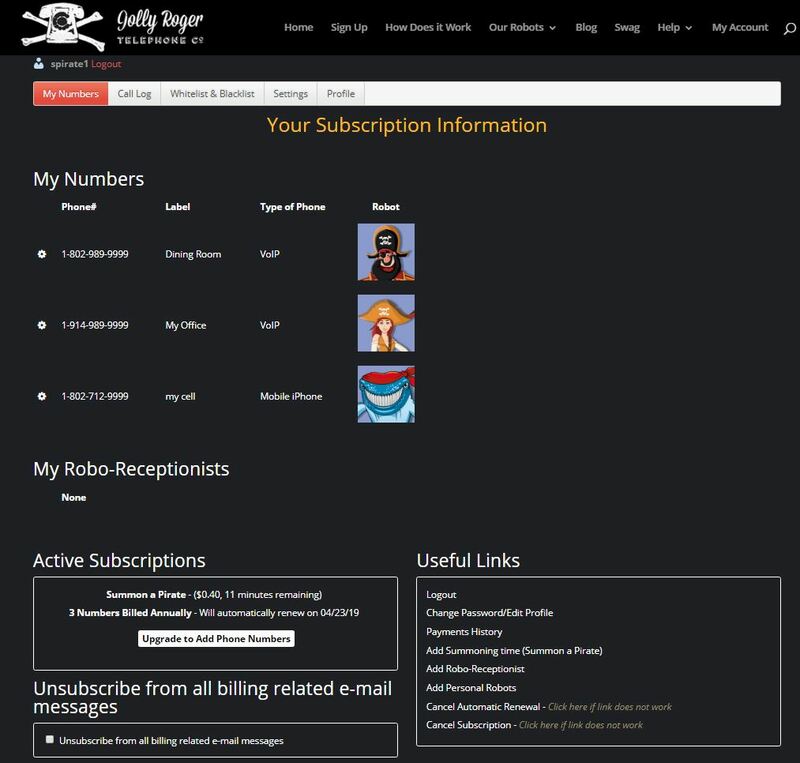 Setup custom Whitelist and Blacklist rules and Jolly Roger will screen all of your calls for you! On the “My Numbers” page, you can see all of the phone numbers that The Jolly Roger Telephone Company is protecting for you. This is the page you are presented with every time you login to your account (there is a setting to change this if you prefer a different first page at login time). The Call Log page shows you all of the calls you’ve received for all of your numbers. It makes it easy for you to listen to recordings or find information about the calls (e.g., did it get sent to a robot? If so, why?) If the list is too long, you can use filters to see only certain kinds of calls (e.g., calls to a particular number or robot). With one click you can add the Caller ID of a call in the Call Log to either your Whitelist or Blacklist. Your Whitelist is a list of numbers from callers you DO want to talk to. Your Blacklist is a list of numbers from callers you DO NOT want to talk to. The Whitelist & Blacklist Page allows you to make rules about which calls are automatically answered by the robots (e.g., they are “Blacklisted”) and which calls we should let through to your phones (e.g., they are “Whitelisted”). You can either specify an exact number or you can specify a pattern. For example, if I always want my mother to be able to call me from home, I would add her number (1-972-555-1212) to my Whitelist. If I want anyone from her neighborhood to be able to reach me, I would create a Whitelist pattern (1-972-555-*) which will then allow calls from any number with the format 1-972-555-xxxx.